The next book in the series (well, more or less the next book), The King's Buccaneer , introduces us to Prince Arutha's youngest son, Nicholas, or Nicky. Besides looking like his father (except for the club foot), Nicky has a lot of Arutha's personality. Nicky, like Arutha, tends to "brood" when deep in thought or upset. And Nicky is upset frequently, as he feels that most people talk about him behind his back, making fun of him as "the Prince's cripple son." Nicky definitely has as chip on his shoulder about that, but he takes his role as noble (and his father's son) seriously - he doesn't like it when his friend Squire Harry is a bit too insistent on flirting with the serving women. Nicky and Harry are more friends than Prince and servant, and Nicky rarely orders Harry around, but he makes a point of telling Harry to knock it off. Nicky is a bit of a spoiled noble, not as bad as his brothers, but he is privileged and knows it. Arutha is more worried that Nicky is too soft and tender to be a good commander - all of his sons are destined to hold strong positions in the kingdom, since King Lyam has no sons of his own. Borric and Erland went off to fight goblins and command troops, and on their trip to Kesh they proved that they were more than spoiled boys. Nicky, however, has never demonstrated the ability to be a leader. Arutha decides to pack Nicky and Harry off to be hardened on the frontier, at Crydee with Arutha's brother Duke Martin. Arrangements are made quickly, more or less to prevent Anita from developing strong objections and the prevent Arutha from changing his mind. Also going to Crydee are the strange not-magician Nakor, and the mercenary Ghuda, who we met in the last book (Prince of the Blood) as companions of Borric. At Crydee, Nicky and Harry are in for a bit of culture shock, as there they really have no rank - or at least not the privileged rank they are used to. Martin decides the boys will act as Squires - Nicky for Duke Martin and Harry for his son Marcus. This is a bit more hard work than the work Harry and Nicky were used to in the luxury of Prince Arutha's court. Still, the boys begin to settle down, and they are learning about the place they live now. While they are out in the forest hunting with Duke Martin and Marcus, Crydee is attacked, and the raiders take a number of common people hostage, plus Duke Martin's daughter Margaret and her companion Abigail, daughter of a noble. Nicky leads an expedition to rescue the hostages, pulling rank on Duke Martin in the process (a Prince's authority outranks a Duke). He's accompanied by Harry, Marcus, Nakor, Ghuda, the castle magician Anthony, and the half-elf prince Calis. The voyage takes them across the sea to a continent no one has visited, and an enemy that has a horrible use for the hostages. Nicky not only pulls rank, he grows as an individual through leadership. He has to face what kept him from having his foot healed as a child, and also learn how to lead men. If he isn't successful, then not only will all the hostages die, a lot more people in the Kingdom will as well. 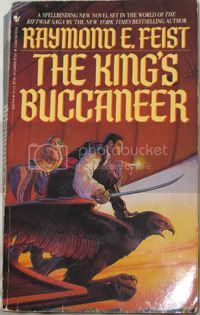 The plot of The King's Buccaneer is where the plot for the arc of the whole series takes off. Unlike the previous book, this one is a major must-read to understand what happens in the next books.